Have you seen “Melancholia” meanwhile ? I liked your montage of the planet above the Munich sky-line. But always if I think back to my year in your city, I remember very happy moments and a nice summer with the mountains on the horizon and green parks with fresh air and the Isar-wave surfer, the concerts we went together and the river-side we had the bone-fire. Melancholia and Munich don”t really belong to each other. Do you know what is really weird ? When I looked closer to the image of the planet Melancholia, I got the feeling that Lars von Trier put a hidden message into the whole story. Am I lunatic ? Or do you also see what I see – that the fuzzy shape of the clouds on Melancholia resemble a Magen David ? Now if we recall that Melancholia at the end just swallows the earth, in a very calm, almost aesthetic, yet destructive process, what might be the secret message than ? I would not be surprised if von Trier tries to express the old stereotype of the jewish omnipower taking over the whole world. Don”t know what is his problem ? The best movies were all by jewish directors. They made cinematografie the most relevant type of creative and expressive arts of modern times. What is his issue with this hypothetical jewish conspiracy ? Are you serious ? You have a very vivid phantasy, girl. I have not seen von Triers movie yet, but now that you claim there is even a hidden message behind the nice special effects, I definitely will go. Yes I red that he recently made some stupid remarks, about his sympathy for nazis (who were responsible not only for the biggest crime in history, but for the most dumb and primitive movies ever). But later, didn”t von Trier suddenly claimed that he might be Jew himself ? O boy, he is flamboyant guy. Doing good movies, but absolut crazy ideas about the society. in a video sequence that demonstrates how the hidden Magen David emanates from it. Look he did a good job. I think he liked it. Enjoy it, but be careful of all the conspiration theories. 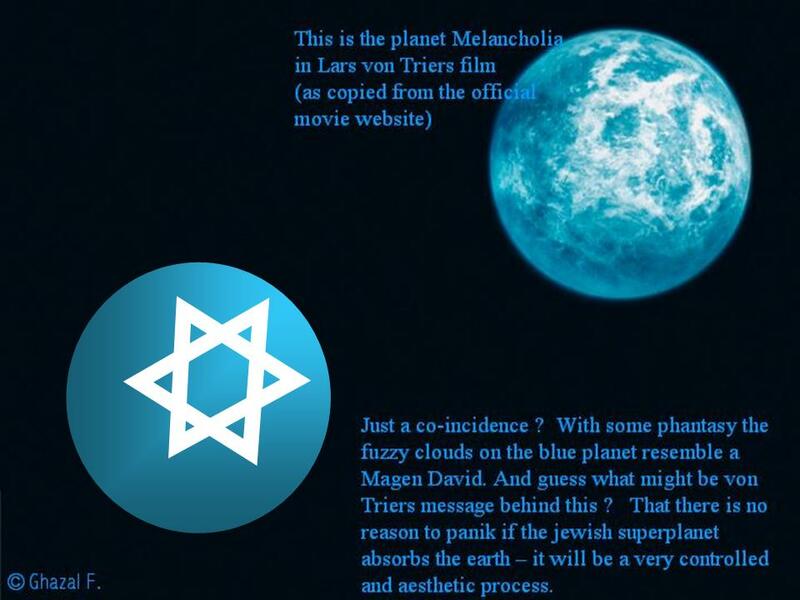 Is it only me who saw a hidden symbol in von Triers tentalizing planet Melancholia ? Am I lunatic, or does the fuzzy pattern of clouds on it really resemble a Magen David ? Check out yourself at my blog http://www.persian-cat.de and tell me what you see. And in case this is really no conincidence, but placed there by von Trier intentionally, than what is the message behind ? If he wants to tell us that the earth will be eaten up by a jewish super-planet, than I have to admit he shows this in the most aesthetic images, no horror scenes, no explosions, no thunder. A very calm process with a deep sense of harmony. Some comments on his movie even said that when Earth collides with Melancholia it looks like the fusion of a ovum with a sperm drung fertilisation. But looks like a symbol, doesn’t it ? Or white chemtrails ? One should ask the film director about a hidden symbolism on this planets surface. Happy to hear that someone considered it worth to comment on. For me, it seems to be a ant face (or head) more than anything. Lars wanted to alarm us about a E.T. insectoïd invasion ! Lars von Trier possibly may have funny ideas about society I am not aware off. His movies are intense both on the themes and emotionall aspects. But I can in no way see a Davids star in the approaching planet from the Melancholia movie. Antisemitism exists but is not everywhere though. Dear Ghazal are you not getting a bit paranoid here?